“Kutch nahi dekha toh kuch nahi dekha“! (Haven’t seen Kutch then you haven’t seen any thing) – This line sounds like a part of any other state tourism marketing venture but things are a bit different in this case. Once at Rann Utsav you see the glistening white panorama of white sands across the blue horizons, you’ll know what I am talking about. 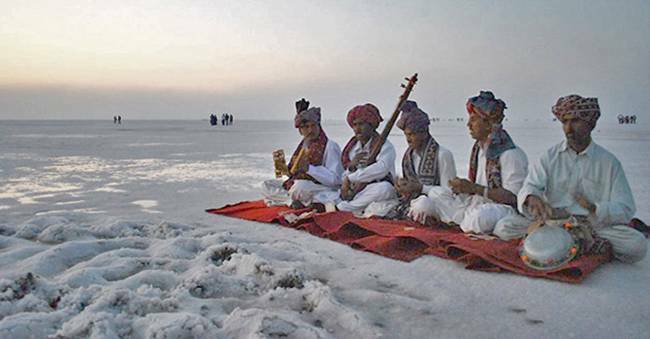 The Rann Utsav, organized by the Tourism Corporation of Gujarat Limited is a celebration of the magnificence of life on the Rann of Kutch which is geographically most unique and culturally, more dazzling than you can ever imagine unless you have come face to face with it. Hogging to shopping, the festivities here have you covered from every direction. The experience is……well, I don’t have a word for it because it’s hard to choose the right word. You really need to see it to understand how I feel right now. Rann Utsav Dates – When does it happen? This grand fiesta is a winter jamboree that happens when the air is crisp and the moon is at its fullest. It is generally a one month fiesta but just like all good things are preferred to be held onto for as long as possible, the Rannotsav is no different. The 2014- 2015 celebrations for instance start at the beginning of December and end in the first week of March. 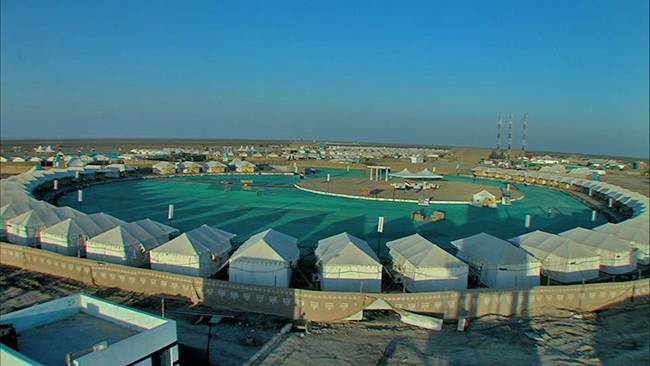 Where Does Rann Utsav Take Place? Starting in Bhuj, the festival covers the entire district whereby the grand finale is put up at the primary destination of the tent city near a small village called Dhordo. Dhordo is easily approachable from Bhuj. Bhuj has a small airport from where Dhordo is 86 km. 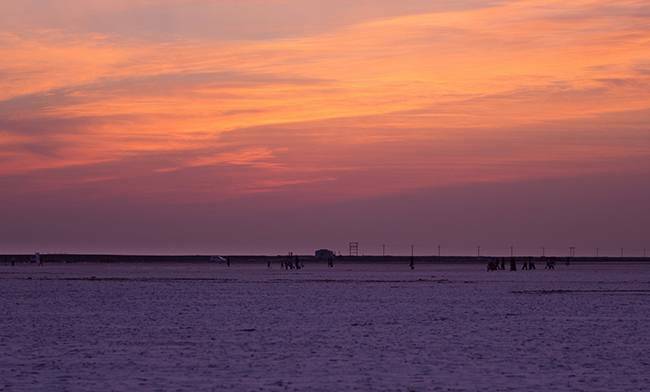 The spectacular Rann of Kutch is the biggest flatbed of endless white sands. This is where they celebrate the festival of life. This whole land-stretch stays covered in water till two months before December but when winter comes, the Kutch is infused with life. Its almost like hibernating white desert. The wonderfully arranged tent city at Dhordo provides you with every possible amenity that you can think of. Room-heaters and air-conditioners to a 24/7 hours of hot water supply in the middle of the desert, you will want for nothing when faced with the extreme temperatures of Kutch. No detail has been left unaddressed here, no requirement unanswered. Apart from the 400 tents, the ‘city’ has a market place, an exhibition centre, an adventure zone and two enormous dining halls. The market here will make your heads dizzy, I tell you. It is because the sea of extraordinary choices will leave you so dazzled and confused at the same time that it might be a bit difficult for you to handle. You are free to feast your eyes on the exquisite hand crafted articles of Gujarat in general and Kutch in particular; there’s plenty of intricate Kutchi embroidery all around, gorgeous block-printed fabrics, beautiful leather articles, stunning silverware and deftly crafted ornaments. Buy as much as you want to. 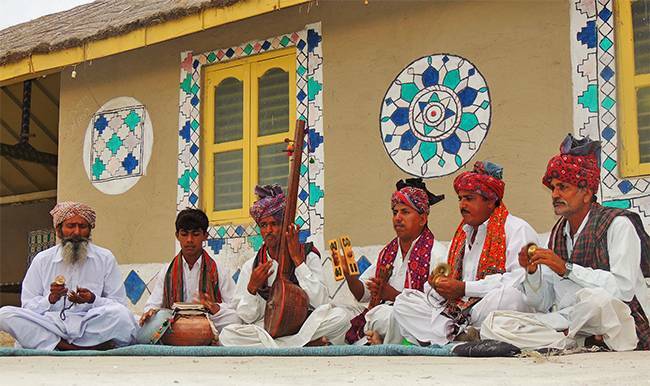 The exhibition centre showcases the vibrant, culture, past and traditions of Kutch. Barren they say the land is but its hard to wrap one’s head around the concept because you are bound to feel the heartbeat of Kutch when you come to the Rann Utsav. Yes, you read that right. Heartbeat it is! Foodies, hold it right there! I know that you shall want to jump on the food as soon as you get here. Surprisingly, people who aren’t ‘foodies’ per se are quite prone to doing the same thing as a matter of fact. The two enormous dining halls serve scrumptuous authentic Kutchi delicacies. Foodies will want to indulge their insatiable appetites and hungry taste buds at all hours and the organizers of the RannUtsav know that only too well. Hence, you have food corners where you can indulge yourself even at the most odd hours possible. The adventure zone caters to the small kids and the big kids all alike. Adults are but big kids and that become all the more clear when you see them here. However, the bikers have something extremely cool in store for them. You can arrange for a solo ride on the desert on a DPV (Desert Patrol Vehicle). It’s like riding a snazzy bike into the sunset, only this is much more exhilarating. The evenings are for you to soak in the culture. This time is for you to enjoy the brilliant performances by the local artists. You will carry the tunes in your heart for long afterwards. I guarantee that. The dances define the word ‘dazzling’. If you haven’t seen those, you do not know the true meaning of dazzling yet. All of this is spread over an area of 1.5 million square meters. Its a perfect combination of the modern and the traditional & rustic. The tent city does symbolize the spirit of Kutch but there is so much more to it. You will never understand this until you have explored the corners of Kutch and seen things with your eyes. The Rannotsav sojourne has plenty to offer to the visitors. You could go for a tantalizing camel safari and once you have finished exploring the desert from a camel’s point of view, you can go ‘bird’ on Kutch. The answer is simple. ‘Hot air ballooning’. The experience is such that you shall never recover. I use the word ‘recover’ because you will face a perpetual compulsion to keep talking about it afterwords. You must attend the Kutch carnival at night. It is special because it is more colourful than you can imagine being made up of every vibrant hue that forms life in this magnificent salt desert. 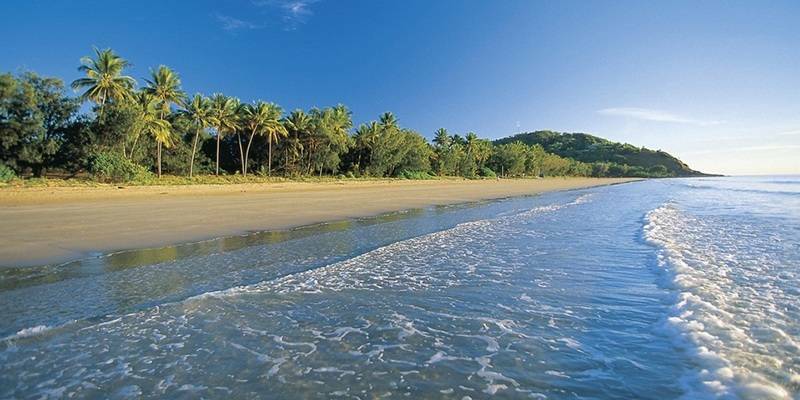 You may take a day trip to the beach at Mandvi and see the blue horizons kiss the sky. Do visit the Indo-pak border and do not forget to say hi to the birds at Narayan Sarovar and Chari Dhand. You can spend an entire day visiting nearby villages as well. Bhirandiyra, Khavda, Gandghi-Nugam or Hodka, they are all known for their amazing workshops. This is where they create magic on fabrics. If you want to bear witness to the creation of beauty, this is the place. Lastly, do not miss the Kala Dungar. Photographers, this one’s especially for you. You cannot afford to have visited Kutch and missed that out. Lastly, make sure you spend a part of the night outside your tent. The Rann of Kutch on a full-moon night is…….I don’t know how to describe it. Suffice it to say that it will change your life forever. No camera, no artist, no genius can reproduce a moon washed salt desert like Kutch. It beats replication! Accommodations are available at the venue by way of Swiss tents and Luxury tents. The nearby villages also offer places to stay. These are ethnic huts called Bunga built to suit any urban tourist. The GTDC hotels are also quite nice. 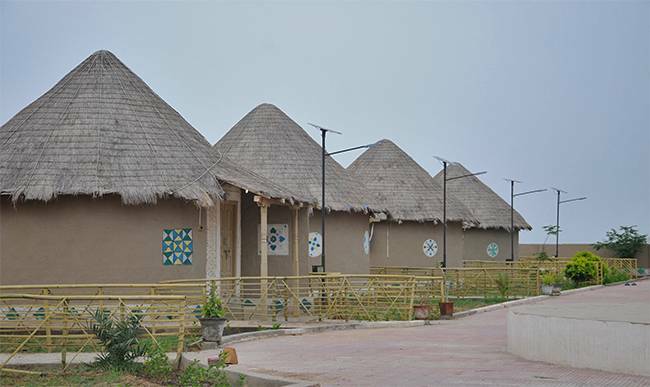 There are several resorts at Dhordo and if you want to live in the closest possible proximity to the Tent City, then ‘Gateway to Rann’ is a resort you’ll love to put up at. Make your bookings at least 2 months in advance. You shall require a government pass to visit Kutch due to its proximity to the border. Passes are easily available at the checkpost in Bhirandiyra. You shall need passes for all days and it’s sufficient if one member of the group has a photo-ID in hand. It generally doesn’t matter much whether or not you have an AC tent to yourself. The nights are freezing for which you shall be provided a heater in any case. Besides, the tents are anyway cooler compared to the blazing heat outside in the mornings. The inauguration faces an enormous rush of visitors. Therefore, it is advisable to reach early at the Bhuj station (in case you are travelling by rail) wherefrom the pick-ups are arranged for. It is best to arrange for a private taxi to reach the venue if you want a comfortable journey to the place. Do keep a ear out for the announcements at the venue which are made in Gujrati and Hindi. For air travel, you need to take a flight to Bhuj and travel to the venue from there. There’s a train called the Kutch Express that leaves from Mumbai, travels via Ahmedabad and goes up to Gandhinagar wherefrom the venue is to be reached by road. You could take a direct train to Bhuj as well. The place is very commutable by roads. There are several buses available from Ahmedabad and Bhuj as from the other major cities of the state. Taxis are also quite easy to arrange for. You must visit the Rann Utsav because it is one of a kind. It is vibrant and it is fantastic but more than anything else, it has a heart…one that beats quite steadily for the visitors.